As children, our school day breakfasts consisted of porridge or various flavoured cereals, but weekends were different. At weekend, we looked forward to cooked breakfasts such as vegetable stuffed parathas, roti and dal, spiced scrambled eggs or a South Asian style fry-up. In our home this was a plate of chilli flecked spiced eggs with tinned tomatoes; or spiced baked beans served with pieces of heavily buttered toast. In those days, you could only purchase the traditional 'baked beans' in plain tomato sauce. Nowadays in the U.K you will find: curry, sweet chilli, Mexican, BBQ and Smoky BBQ flavour baked beans. Anyway, on one of these days my mother made her version of chickpea 'baked beans'. 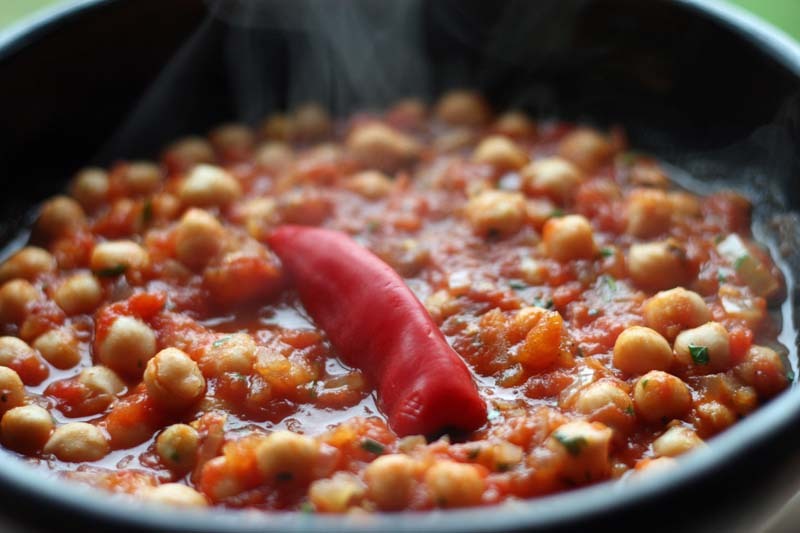 My mother always had chickpeas in the house, both the dried and canned variety, so this dish was easy to put together to feed the grumbling bellies of her hungry children. Some things have not changed. I too always have both dried and tinned chickpeas in my cupboards. I was reminded of my mothers spicy chickpea 'baked beans' recipe, whist talking to my brother on the telephone, fondly remembering carefree, childhood days gone. A few days later, I found myself reminiscing of flavours and comfort dishes from my childhood. It was yesterday for brunch, I wanted a change from the waffles or usual baked beans for brunch. 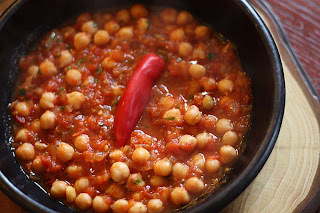 So I made a version of my mothers Spicy Chickpea 'Baked beans'. If you don't want to eat this as brunch and I can totally understand why, You could also serve this with potato chips, wedges or poured over a baked potato. One of these days, I may show you’re my 'spicy tinned tomatoes' dish – a real guilty indulgent pleasure of mine. It is a breakfast/brunch dish I eat alone, usually when D is away. It doesn’t look very pretty: splattered and deep red, but it tastes good to me. In a wide pan, heat the oil and add the shallots and chilli and cook over medium heat until the shallots are tender. Add the tomatoes and cook until the sauce has thickened. Add in the chickpeas, salt and garam masala and cook for a few minutes before stirring in the coriander. Serve with toast and a fried egg if you so wish. *If you like the sound of this, but don’t want the chilli hit, you could omit this and stir in a teaspoon or two of tamarind concentrate with the tomato. The flavour will be tangy. I think this sounds delicious and something easily put together on short notice but also would be great for a rainy day like we are having here. Hey..you sure are getting a lot of followers...GREAT!! and congratulations. I think I'm going to have this tonight! It certainly is worth making on a rainy day. Its raining here too. Yes, Thanks! I am pleased to see the new (and old) followers. I truly am humbled. Mmmm, this looks lovely and I am definitely going to try it. Probably for lunch or supper though. This looks delicious! Easy & spicy healthy meal :). Just had it and it was delicous. Two thumbs up. Just the thing for a very rainy evening in Switzerland. Thank you. Thank you for letting me know P M Doolan. And so delighted to read that you enjoyed it. Its pretty easy to put together too. So its raining where you are. Guess what it's raining here in Scotland too. That is one of the reasons I had it yesterday. Kind wishes! It looks and sounds delicious and what wonderful weekend breakfasts. We certainly were spoiled as children. Cool idea! Bakes beans chic peas style. Oh, this is such an interesting take on baked beans! I love it! This sounds really good! I always have chickpeas on hand because there are so many fanstastic ways to enjoy them--this is definitely one of them! Tamarind is one of those ingredients I really know far too little about. A spicy and hearty meal mmmmm :). Sounds easy and delicious! A teaspoon of Tamarind in a cup topped with hot water is a good zingy drink. Thank you Diana. It is so easy!